The grand finale of the Tuesday night snow shoe tour! 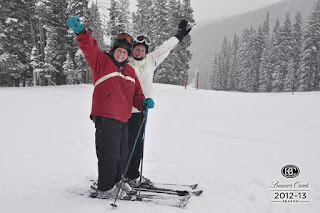 I just returned from my staycation up at Beaver Creek. For those who aren't familiar with Colorado ski resorts, Beaver Creek is just past Vail along on I-70. It's beautiful. And by staying Monday-Thursday, we enjoyed beautiful ski days with no lift lines. If you make it up to Beaver Creek sometime this ski season, here are a couple fun and free activities you can enjoy. Beaver Creek's tag line is "Not Exactly Roughing It." Definitely the way to play and stay! Epic Mix Photos - Catch one of the photographers in green while on the mountain. They will scan your pass (even if it's just a day pass) and you can get free digital photos to share on Facebook. For a fee you can also get them printed in the village or download higher quality digital copies. 9:30am at the top of Centennial Express it's Cocoa and Corduroy - get off the lift and get a cup of cocoa, complete with whipped cream. Just what you need to start your day. 3:00pm at the base of mountain in Beaver Creek Village - fresh baked chocolate chip cookies. Just catch one of the staff in the chef hats before they are all gone. S'more O'Clock at the Park Hyatt - This is one of my favorites. S'mores by the firepit from 4-5pm each day during peak ski season. Thursday Night Lights - I need to go on a Thursday night for this. There are fireworks and a glow-stick ski down. What's not to like? Do you have a favorite ski resort? What do you love?